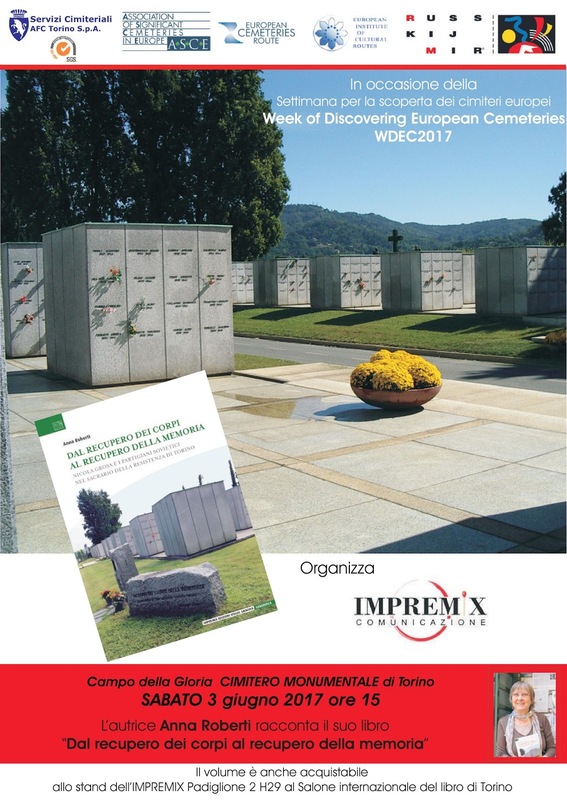 On Saturday, June 3, 2017, at 3 pm, the presentation of Anna Roberti's book at the Monumental Cemetery of Turin in occasion of WDEC. Nicola Grosa and Soviet partisans in the Memorial of the Resistance of the Monumental Cemetery in Turin. "72 years have elapsed since the end of the Second World War and 50 of the partition of the Monumental Cemetery in Turin to the Memorial of Resistance to honor the partisans who fell in the struggle against Nazi-fascism. Among them, also dead in other Italian regions, there are ninety soldiers from the Soviet Union. Nicola Grosa's "mission",sought to recover their bodies, reverberates the reconstruction of the year, the partisan militancy, and the circumstances of the death of these Soviet partisans and the memories of those who had the fortune to survive.